Gallery Yamaki Fine Art is pleased to hold an exhibition of Benoît BROISAT (born in 1980 in Bonneville, France), young and recognized French artist who has been energetically examining the mechanism of representation by using a wide range of media including drawing, installation, photography and digital animation. His first solo show at our gallery will focus on the crossing-over of personal/collective memories through his early representative work “Bonneville” and two new projects for this exhibition. 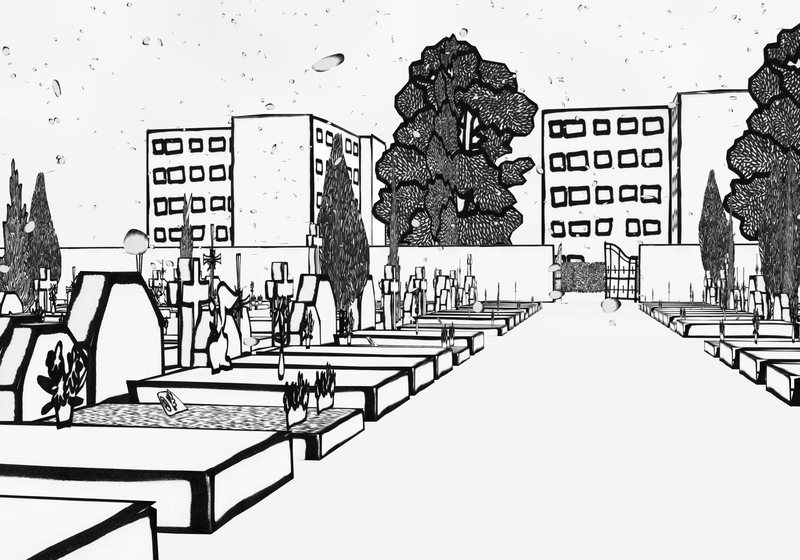 “Bonneville” (2007) is the representative work of Broisat with over 1000 drawings composed in an animated video. In this work, Broisat tries to reconstruct his hometown, Bonneville, from the fragmented memories of his real experiences as a child. This landscape of memory is gradually interwined with the viewer’s own memory, raising new individual stories. Christian Boltanski, the first person who first introduced Broisat in Japan as curator, writes about this work: “I think that what is characteristic of the work of the artist is that he speaks about his village but each viewer thinks: “That’s my village.” Everything we do is between the individual and the collective.” This accurate words also explains two new projects for this exhibition. “Recollection,” which consists of the miniature of historic sculptures and their maximized photos, also concerns “memory.” Masterpieces such as Venus de Milo and David are recreated depending only on the artist’s own memory, and then collated with viewer’s art-historical memory. By re-questioning the relationship between memory and real object, this work even raises a fundamental question about the function of “collection” by the museum. This exhibition will also show the process of the artist’s creation with sketches or other products, allowing us to grasp the way how his thought has taken form. We will be happy to have you at this precious opportunity to take a closer look at his rich development in his activities.